Spokesmama: Bike To Work Week is Here! Bike To Work Week is Here! You'll Feel Great - Get healthier without even noticing it! The Prizes. 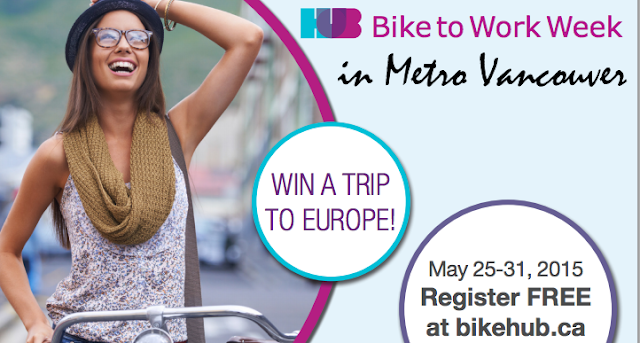 With over $15,000 in prizes, including a trip for 2 to Europe and 6 new bikes, why wouldn't you sign up? Get Places Faster. Don't believe it? Try it out. Save Cash. Don't you want extra money to spend on things other than transportation? It's More Fun. Try it and you'll agree! Plus there'll be free food, snacks, coffee and bike repairs at over 60 Celebration Stations throughout the week. No need for the grown ups to have all the fun, it's also Bike To School Week, so your kids can get involved too!